(Newser) – When it comes to blood types, you may know A, AB, B, and O—but those larger groups actually contain millions of different varieties. That's because the surface of our blood cells are coated with antigens—up to 342 of them. Whether you have certain ones determines your full blood type. And in 1961, scientists stumbled upon a new blood type they thought impossible: one called Rh-null, meaning it's lacking all 61 antigens in the Rh system. In the 49 years that followed, only 43 people on the planet had been IDed as Rh-null. One of them is a Swiss man named Thomas, Mosaic reports. 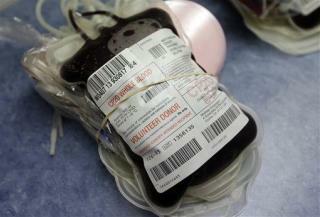 As the Smithsonian noted in June, there are fewer than 10 active Rh-null blood donors in the world. That means injury poses a major risk for Thomas, but it also means that he has the power to save lives. I'm a 42 year old man and I'm AB- Rh-null. I founded out about a year and half ago that I was Rh-null. When I had to be rush to the hospital. I was down to 2 pints of red blood cells in my system. After all the test they ran. I had to get a blood transfusion of 3 pints of blood and it took they 30hrs to get 3 pints of my blood. When I gave blood they always told me I was AB-. They never told me I was Rh-null. In November I had to have my spleen removed and it took 36hrs to get 4 pints for back up for surgery. I am ORH NEG BLOOD TYPE!